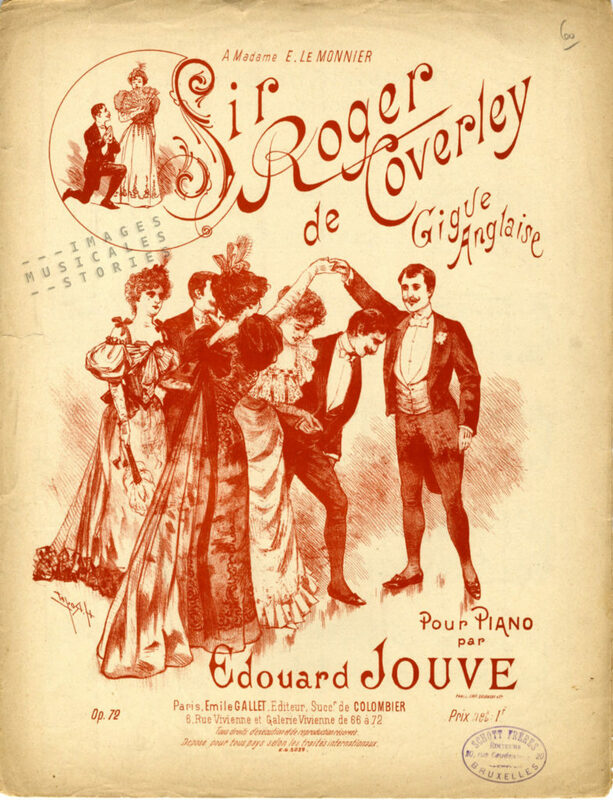 ‘Sir Roger de Coverley’ (Gigue Anglaise) published by Emile Gallet (Paris, sd) and illustrated by Hyacinthe Royet. Sir Roger de Coverly is an intriguing name for a dance. Some say its name refers to a fox. Surely, the wiggly dance steps suggest the jumpy flight of a hunted fox. 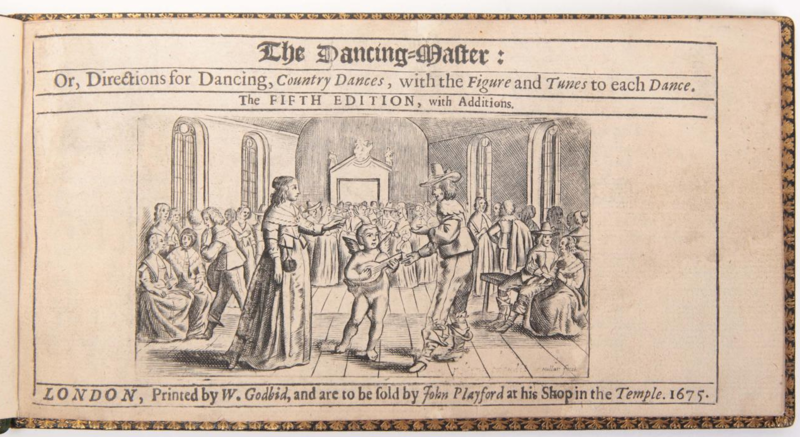 As early as 1685 John Playford included the instructions for the country dance in his manual The Dancing Master. The Dancing Master, the 5th edition published by John Playford in London in 1675. The Sir Roger de Coverley knew a revival in the 19th century and also became a success in the French ballrooms. Perhaps it is this print in The Graphic that inspired Hyacinthe Royet to draw the sheet music cover that started this post. 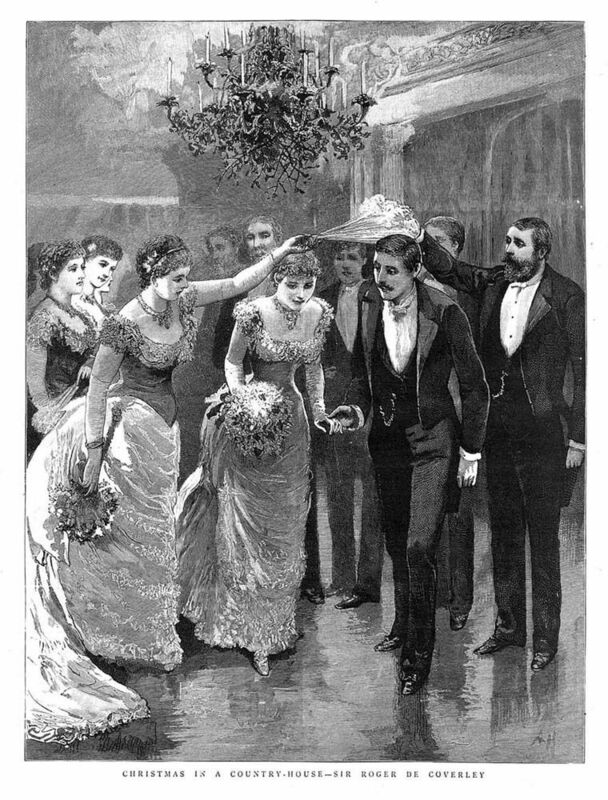 A polite image of country gents and ladies who stiffly move around under the mistletoe, wearing bored expressions. No foxy ladies and no fun at all, if you ask me. 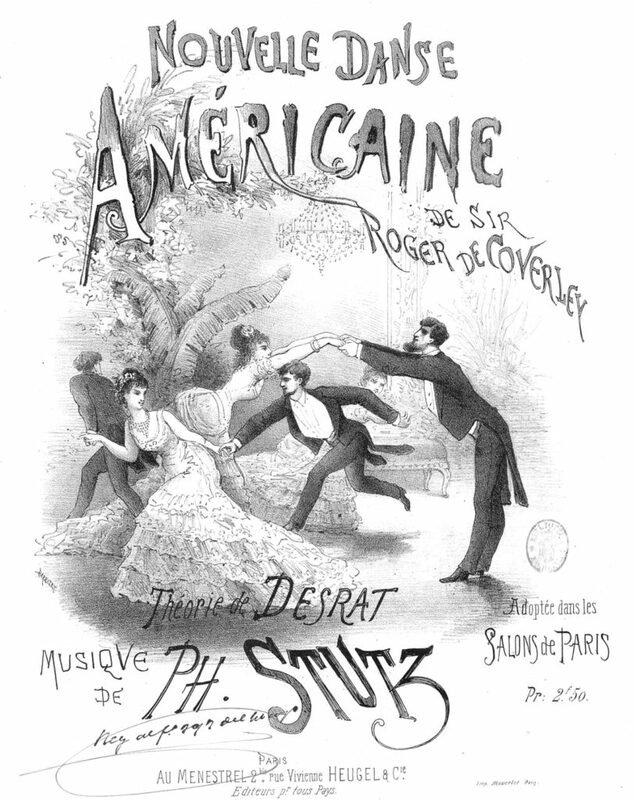 We found a more lively rendition of the dance in a cover drawn by Barbizet. An annotation in this copy indicates that the French preferred a more vibrant dance: “In England, the jig is concluded by a lady’s chain, but the length of the dance in that case renders it monotonous and for this reason, the finale has been suppressed in France.” Strangely, the Sir Roger de Coverley was in this case sold as a Danse Américaine. ‘Nouvelle Danse Américaine de Sir Roger de Coverley’ by Ph. Stutz, published by Au Ménestrel (Paris, 1875) ans illustrated by Barbizet. Did you wonder how to dance the Sir Roger de Coverley? The 1951 film Scrooge might give you a good idea. It is an adaptation from A Christmas Carol, the book that Charles Dickens wrote 175 years ago. The fragment begins with the spirit showing to Ebenezer Scrooge the annual Christmas party thrown by his former employer, old Mr. Fezziwig. Just tap your feet in time to the music and enjoy the Yuletide dance. Beware, this version is danced at a very swift pace. Interestingly, in 1922 the English composer Frank Bridge arranged the folk song for a string quartet. To enhance the Christmas mood the composer mixed in the Auld Lang Syne melody (at around 3’50”). I, for my part, will blithely put on my skates and dance the Sir Roger de Coverley on Ice. Merry Christmas! 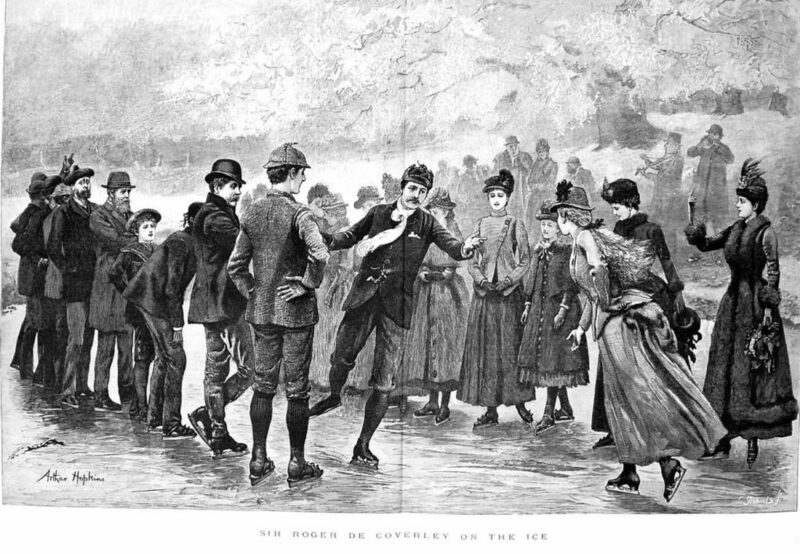 ‘Sir Roger de Coverley on Ice‘ from The Graphic, 1889. Illustrated by Arthur Hopkins.